But Please? Please? !Oh, those puppy dog eyes. All your sweet little dog wants is one single solitary morsel of what you're about to put in your mouth. Just. One. Taste. Pleeeeeaaaaasssseeee. Their Insides Are Still WildWe know you and your pooch think alike, dress alike and go everywhere together but there are fundamental differences that make what you both should eat so different. Mouth Your jaw moves up and down, side to side. Dogs only move up and down, but their sharper teeth make up for this. While ours are flat, they have flesh-tearing teeth that can handle big chucks of raw meat at once. But they're still cute and sweet. Both of our mouths contain saliva to help break food down before we swallow it. Your dog's mouth also has antibacterial properties. Wait, what? Well, how do you think they eat their own poop? Just sayin. Stomach Because dogs are genetically predisposed to eat mainly meat, their stomach acid is up to 100 times for acidic than ours. Yeah, bones and cartilage are harder to break down than cottage cheese and pasta. They need it, we don't. Digestive Tract As humans, our digestive tract is way longer than our furry friend's. Because, in the wild, dogs eat internal organs and maybe even rancid meat, their tract needs to be shorter so they can quickly dispel potentially toxic food.Want proof of their short digestive tract? Give your dog a carrot (on the safe list) and watch how quickly it… ahem, comes out in the wash.
Well, that's the question isn't it? Surely there will be a time when you will give in to those insanely cute eyes and pleading face. When you do, make sure you're sneaking your pooch something good for him. We've Made a List and Checked It TwiceLet's start with the good news. There are a ton of foods you eat that are actually good for your dog. He'll never know you slipped him something good for him, if you're eating it, it's gold and he wants it—now. Some dogs go crazy for vegetables and some will look at you like they're worried they've never really known who you are. Vegetables are a great way for us to get vitamins and nutrients we need but are all vegetables something dogs can eat? Corn—plain, cooked kernels in small amounts are good just take it off the cob. Peas—as long as they're fresh or frozen never canned—that's too much sodium. Celery—a good source of Vitamins A & C just make sure the pieces are small enough to not be a choking hazard. Sweet potatoes—Oh yes—often a main ingredient in dog foods mashing some cooked, plain, skinned sweet potatoes is a great add to dog food as treat now and then. Potatoes—yes, in moderation, but they have to be cooked and peeled. Raw potatoes and potato skins can be toxic to dogs. Vegetable Don'ts Onions—these contain a compound toxic to your dog that will cause anemia—sometimes so severe a blood transfusion is required. Beware onion powder, juice and leaves—all are just as dangerous. Garlic—for exactly the same reason as onions. The chemicals in garlic cause anemia. Green tomatoes—tomatine found in these buggars can cause weakness, difficulty breathing and abnormal heart rates. Mushrooms—dogs can eat store bought plain mushrooms but there are too many toxic varieties out there and we tend to mix them with onions and garlic so play it safe and just say no to shrooms. Nothing is better on a summer day than a bowl of fruit. That's a lie. Ice cream is first, then pie, then fruit. So, can dogs eat a little piece of that sumptuous fruit you're nibbling on? Let's see. Blueberries, Blackberries and strawberries-heck yes! full of antioxidants, vitamin C and fiber toss him a few as you're munching away. Pineapple—yes, but only in small amounts. It's not toxic but he may experience some, um, volatile digestive issues on its way out. Watermelon—A great source of water, Vitamins A & C, this can be just as refreshing for your dog as it is for you. Remove the seeds and rind as these can cause an upset stomach. Apples—Yep! Vitamin C and fiber make apples a great snack. You MUST remove the apple seed because these contain cyanide—CYANIDE people. Mangoes- If you're fancy enough to sit around eating mangoes, you can feel good about giving your dog a slice of the peeled, pitted fruit. Bananas—Full of vitamins, it's even been said that a small amount of mashed banana can calm his stomach down. Pumpkin—Pumpkin is a fruit? Yes. And it's great for your doggies as long as it's pure pumpkin puree and not pumpkin pie filling. Grapes and raisins—RED ALERT! One of the most toxic food to dogs, if ingested, will require an immediate call and trip to the vet. Left untreated it can lead to kidney failure and death. Avocado—RED ALERT! Another big danger to your dog because of the toxin persin which can cause fluid buildup in the lungs leading to breathing difficulties and even death. Lemons and Limes—another fruity no-no. A toxin called psoralen can, at best, upset their digestion and, at worst, lead to muscle tremors, liver failure and death. Cherries—technically dogs can eat them, but we're going no on this one because their shape is a choking hazard and their pits contain cyanide—CYANIDE people.Can Dogs Eat Grains? Now we're getting to the good stuff. Who doesn't love a good grain? Well, we mean pasta and bread because… delicious. It's so easy to want your furry friend to enjoy the better things in life. 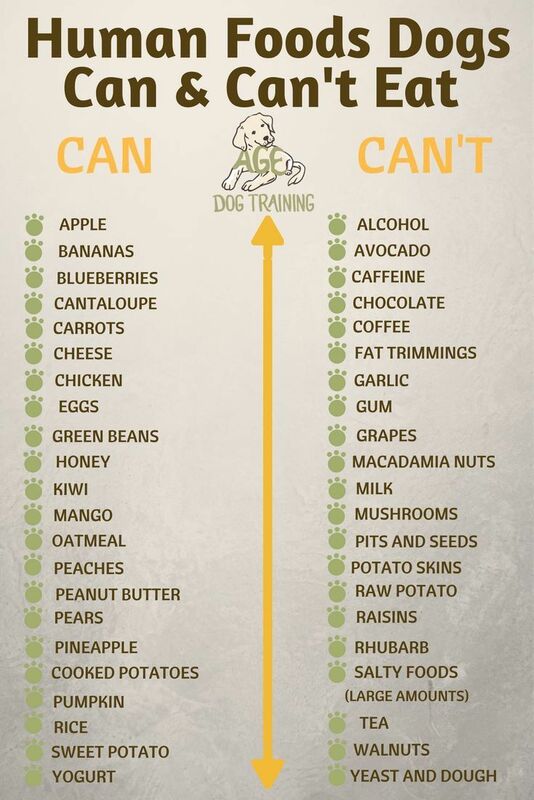 Check out our list before you do.It may be as hard on your dog's system as it is on your waistline—no judgement. Bread—dogs can eat plain white bread. Omit the butter and be absolutely certain there are no raisins, cinnamon or nutmeg as ingredients. Rice—yes, cooked white rice is recommended along with boiled chicken for pups with upset stomachs. Just add nothing to it. Oatmeal—plain, cooked oatmeal is a great source of fiber and iron—just don't give it to him often as it's high in calories and will pack on the pounds. Pasta—Can dogs eat pasta? Yeah, but we're not crazy about it—It's awfully fattening, and your pal doesn't need it. Raw Yeast Dough-RED ALERT! You probably don't sit down with bowl of raw yeast dough on Tuesday nights but because when the yeast ferments and produces alcohol, it becomes extremely toxic to dogs. Can Dogs Eat All Protein? Protein can come from a lot of different sources but not all are good for your dog. Before you scrape all those leftover pieces of meat into your little's guys bowl, know whether you're doing him a favor or just trying to win points. Eggs- One of the best people foods dogs can eat—packed vitamins, minerals and a complete source of protein, we give this an A+. Salmon- For sure! Omega-3 fatty acids reduce inflammation and can ease painful joints—just make sure you cook it as raw salmon can have a parasite potentially deadly to dogs. Chicken—100% yes.Make sure the chicken isn't seasoned, is cooked through to avoid salmonella infections and is removed from the bones as they can cause internal damage. Turkey—Plain, cooked turkey is fine for dogs—no seasonings! Pork—Yes, with caution. The pork cannot be bacon or ham because of the salt content and it has to be plain, unseasoned but cooked pork. Beef- Lean, trimmed, plain, cooked beef will make him go nuts and you smile as you think of all the healthy protein and iron he's ingesting. Fat—what? We all grew up giving our dogs the trimmed fat from meat. Well, what we didn't know was too much fat can cause pancreatitis which can be fatal. Bones—That's a hard no. Given how many toys and treats that are almost 100% safe for dogs, there's just no need to risk a bone splinter wreaking havoc through his digestive tract. Sitting around on a Friday night watching movies with our dog sounds like a perfect evening. Add in some snacks and we may never get up.Snacks are particularly important to understand because they're the most likely to drop without you knowing—we've seen your couch cushions—so you may not even know you've exposed your movie companion to something harmful.Know of your surroundings or maybe just eat your snack one bite at a time. We're kidding, shove it in there like the rest of us. Just check out our list first. Peanut butter—If you're like us, sometimes a jar of peanut butter and spoon equals a snack. If it's natural, no added sugar or salt, your buddy can have some too—just remember it can lead to weight gain pretty quickly. Popcorn—Yes, but it should be air popped, dry and not salted—not our thing but if it's yours, hey, share a little with your dog as long as it's a fully popped kernel. Cashews—plain cashews are fine but in only very small amounts as they're super high in fat and can lead to pancreatitis in rare cases. Peanuts—yes, but only shelled, not salted and only a few because of the high-fat content. Chocolate—RED ALERT! One of the deadliest substances to dogs because it contains theobromine and caffeine, both stimulants your dog cannot metabolize! Never share and make sure you keep all chocolate out of reach. Macadamia Nuts—NO! These nuts contain an unknown toxin that can cause hypothermia, breathing problems and tremors in our little friends. Almonds—Surprising? Well, they're high in fat but, more than that, they're super hard for your little guy to digest and just aren't worth the trouble it may cause him. Cheese, cottage cheese and milk—Lactose intolerance is common in dogs so unless you want to watch—and deal with, him having terrible gas, diarrhea and vomiting, it's not worth the risk. Can Dogs Eat Coffee, Beer and Spices OH MY?! Whether you're hanging out with your buddy in the morning, reading the Sunday paper as you sip coffee or wearing your matching jerseys during the big game over a few beers. It's natural to want to make sure nobody is watching and slip your pal a little sip on the side.The best of intentions can have terrible consequences and beverages are a dangerous category for your pooch. Take note, we only have a “Don't” box here. Alcohol—some people may think it's cute to slip a little beer their dog's way. It's not, it's poisonous—even a small amount can lead to ethanol poisoning and death. Caffeine—both from coffee and tea overstimulates your dog's central nervous system and can lead to hyperactivity, abnormal heart rhythm and lung failure. Cinnamon—while not toxic it can be an irritant to your dog's mouth and digestive system Nutmeg—this spice contains the compound myristicin which is toxic to dogs causing high blood pressure and even seizures. Xylitol—Xyli-what? This is a sugar substitute found in baked goods, candy and toothpaste just to name a few and can cause seizures and even liver failure. Salt—this can lead to high blood pressure and heart issues in large amounts—trust us, they like their food just fine under seasoned. If he's showing any signs of side effects get him immediately to your vet or an emergency vet if it's after hours. Don't mess around and hope the symptoms will go away. There's such a thing. Their number is 888-426-4435. It's a good call to make before heading to the vet if you're unsure about the danger involved. They're 100% trained in what dogs can eat safely. Prevention!! That's the answer! We all realize our dogs are seriously like having a perpetual two-year-old around. You need to toddler proof your house. Put all dangerous foods on the top shelves of pantries and refrigerators—all that bragging about your dog being smart is true.Where there's a will, there's a way—takeaway their way, ok? If you have one of those dogs that can not only wolf something down in two seconds but would prefer a treat above all else, you need to be extra vigilant in your efforts to save him from himself. Don't leave coffee, tea, plates or snacks on a table as you sneak out for two seconds—that's all it takes. So, you're going away overnight, for a weekend or even a real live week-long vacation. You want your little guy to be as comfortable as possible, so you hire a sitter or guilt your sister into watching your fur baby.You can't go traipsing into the big wide world without letting the sitter know of all the innocuous dangers lying around the house. You're not a monster, for crying out loud. You'll want to print this out and tape it to the fridge. And the front door. And the bathroom mirror. You get it—she has to know if dogs can eat certain things or not. You'll also want to leave the poison control number, vet number, emergency vet number, secondary babysitter number and all your vacation details. Right about now you're talking yourself out of a vacation. It's ok—go. Just make sure the sitter sends pics daily or hourly—whatever you need to get through your glorious trip away. What's in the Box? If you really want to indulge your baby with some homemade doggie treats—do it!! We have a favorite one, but a simple search will yield a variety of recipes.For your doggie to get the most nutrients out of his treat, look for ones that are mostly grain free. It's hard to avoid completely but minimize where you can. When you see ingredients like salt, sugar or spices, omit them. Your dog doesn't need them, he certainly won't miss them and not every blogger knows if dogs can eat all the ingredients safely. Your main goal is to keep your furry friend happy and healthy for as long as possible. Annnd, you probably want to feel like a rock star owner and slip him some people food now and then. We get it. We want you to win “Best Human Friend of the Year” too. Your knowledge of safe vs. toxic food will keep him healthy and happy because he'll still get human treats now and then.